I am interested in questions addressing large-scale geological processes shaping Earth’s topography through the couplings between climate, tectonics, and exhumation. Plate-tectonic processes are responsible for the construction of mountain belts. Controlled by climatic factors, erosion and sedimentation influence orogenic shape, width, and internal deformation pattern by changing its mass balance. Yet, the feedback mechanisms between climate, tectonics, and erosion operate on long time scales of 105-107 years. The understanding of global-scale interactions between these factors thus also requires long-term, orogen-to-global-scale investigations, which remain relatively sparse and are impeded by uncertainties of tectonic, climate, and erosion history reconstructions. In my research, I combine field work with analytical work and numerical modeling. 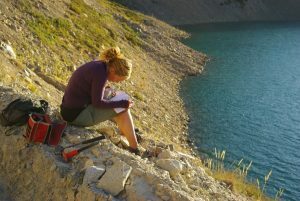 Fieldwork provides a basis to formulate research questions and, in particular, a deeper understanding of processes shaping Earth’s topography. Conducting laboratory work creates the sensibility for data quality and helps to interpret the obtained results in a straightforward manner. Finally, modeling enables us to process the large dataset necessary to study large-scale physical processes. I use the Chilean Andes as natural laboratory to study the feedbacks between climate, tectonics, and mountain topography, which are expressed by exhumation. The Andes are a suitable natural laboratory, because they are characterized by a relatively stable subduction zone since the Jurassic and cover several global climate zones from arid in the north to very humid in the south. Furthermore, thanks to the extensive coverage with thermochronological data in literature, the temporal-spatial Ma-scale exhumation history can now be appropriately constrained by inverse modeling. I achieved my Master’s Degree at the Swiss Federal Institute of Technology (ETH) Zürich at the Department of Earth Sciences in September 2014. In my Master thesis “Provenance Analysis of the Laga Formation (Messinian, Central Apennines) “, we addressed the question of a possible Messinian linkage between the Alpine realm and the Central Apenninic foredeep by combining traditional sandstone petrography with fission-track dating of detrital zircons. In my Bachelor thesis, we related the sedimentation rate of proglacial Lake Trüebsee (Swiss Alps) to Holocene glacier fluctuations and analyzed the frequency of flood events. During my studies, I was employed as tutor for different Bsc courses at the Department of Earth Science and did an exchange semester at the NTNU in Trondheim, Norway. After my studies, I was employed as a technical assistant at the ETH Zürich for one year for various lab work and field assistance.